'Haunted Spaces, Sacred Places' is an amalgamation of archaeology, history and the paranormal. The author, an archaeologist by training, has a keen interest in Fortean phenomena. This book combines those passions, and it is a good mix. There is a wealth of fine historical material about the sites chosen by the author, many of which were either prehistoric, or built by more recent peoples who left no written records. Hence, there is already an air of mystery surrounding such locations as the Western European megalithic monuments, Chinese 'pyramids' and the various mounds found in North America. Brian Haughton expands that mystery by taking an in-depth look at folklore accounts relating to the sites, and brings in more contemporary accounts of paranormal goings-on too. What the author seems particularly good at is presenting this eclectic material in an impassive, almost neutral way. His viewpoint is mildly sceptical, as one might expect of academically-minded archaeology buff. But he is no knee-jerk debunker. He allows the reader to reach their own conclusions. He even seems to show signs of sympathy towards the pagan traditions of classical Greece, the country where he now lives. His take on New Age enthusiasts is less sympathetic. But, surprisingly perhaps, he is at his most critical when discussing archeo-astronomy. He does not share the present-day fascination with astronomical alignments of various prehistoric monuments, even when those theories are offered by academic researchers. Instead, he argues that the ancients had a less technical mindset than is asserted by many modern researchers. Personally, I don't agree with his viewpoint here. In this context, it is a great pity that 'Haunted Spaces, Sacred Places' did not cover any Egyptian sites. The ancient Egyptians were not particularly good at technical astronomy (compared to, say, the Chaldeans), but, even so, the archeo-astronomical alignments of some of their temples are clear for all to see. The movement of the heavens clearly meant a lot to them, and this reflects a general pattern of fascination with the sky among many ancient peoples, including the Chinese and Maya. So I would not be so sceptical of an astronomical explanation for many megalithic monuments, particularly in Western Europe. Building structures to help make sense of the heavens seems to be a wholly natural human preoccupation. This is a studious, but highly readable book. There is an excellent bibliography, and a wealth of fascinating stories contained within. I found myself becoming increasingly immersed in the various topics discussed, and found Brian Haughton's writing style much to my liking. I particularly enjoyed his material on Glastonbury where he skilfully separated fact from fable. Other highly memorable chapters covered Mount Shasta, Ayer's Rock and the Mausoleum of China's First Emperor. One is left with a desire to get involved in archaeology; you can feel the palpable sense of excitement about the big finds; the treasure troves, the quixotic architecture, and the enigmatic religious practices of the ancients. It's all entirely fascinating, and Brian Haughton's love of the subject shines through the book. 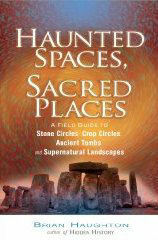 Subtitled "A Field Guide to Stone Circles, Crop Circles, Ancient Tombs and Supernatural Landscapes"